Progress cotinues on the home of Tory Crowder and Sean Thomas. All of a sudden, it seemed as if everything was happening at once. After an epic slog through design and approvals, and then almost half a year of what had seemed like a more or less orderly construction process, Tory Crowder and Sean Thomas had began to fret that they'd lost control over the 2,700-square-foot home they're building for their young family in an older Etobicoke neighbourhood. "I feel like we're having to make a lot of decisions right now," Ms. Crowder, a publicist, said last week as she ran the gauntlet of the construction debris in the front yard and clambered up a paint-splattered ladder into what will eventually be the dining room. "It's getting complicated." Anyone who's gotten down and dirty with a home-building project will feel Ms. Crowder's pain: Once the foundation is dug and built, and the framing's completed, all the interior systems need to be installed, setting in motion the fraught drama of sequencing subcontractors, sorting out lingering mysteries on the plans and making countless small choices that collectively add cost, frustration and delay. The HVAC and the plumbing, she said, were like a one-two punch to the gut. All of this, however, paled in comparison with the chaos that arrived with the HVAC systems earlier in the summer. When Ms. Crowder and Mr. Thomas's general contractor and his subcontractor scrutinized their architectural plans, they noticed something strange: The design inexplicably called for two furnaces and two central air-conditioning systems, even though the house itself is relatively small by new build standards. "It was a disaster from the get-go," she said, noting that they had their architect, Altius managing partner Graham Smith, redo the plans for the HVAC systems three times before the equipment could finally be installed. "You would have thought someone would have looked at the HVAC plans, but we didn't." Mr. Smith, however, explained that he aims to design homes with proper climate control so there aren't huge temperature variations between the upper and lower floors. But that entails creating separate climate zones within the structure, each serviced by a dedicated mechanical system. 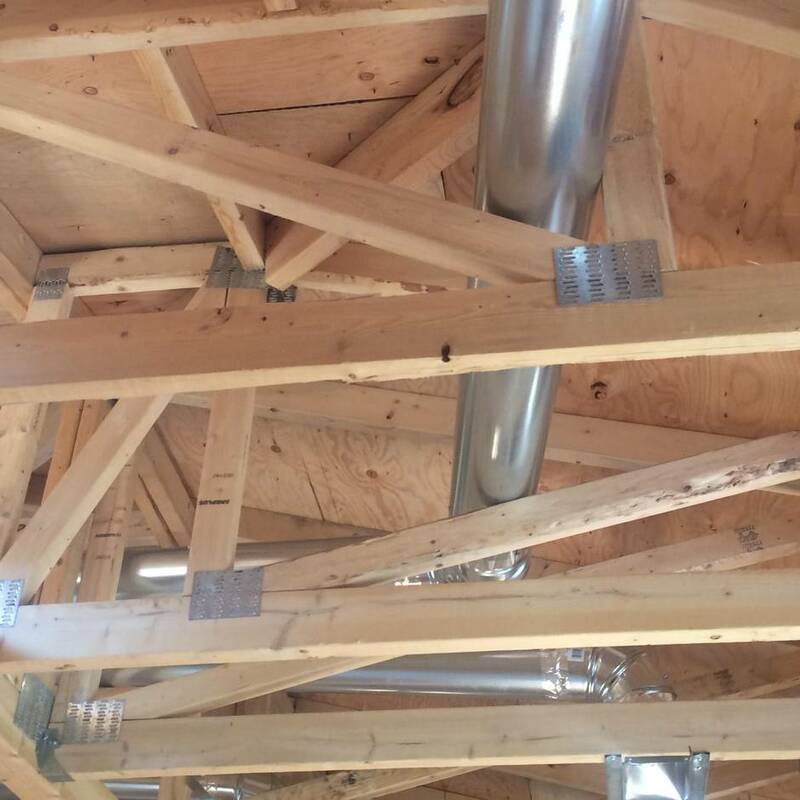 When the mechanical contractors took a second look, he added, they recommended a second option – single high efficiency furnace/air conditioning system with specialized zone dampers. Still, for Ms. Crowder, the experience serves a lesson for anyone building a house: "Look at your plans." The narrative around the exterior finishes – the application of which began almost immediately after the HVAC equipment had been installed – has been happier, Ms. Crowder said, gratefully, although that portion of their project has also come with its own set of question marks. 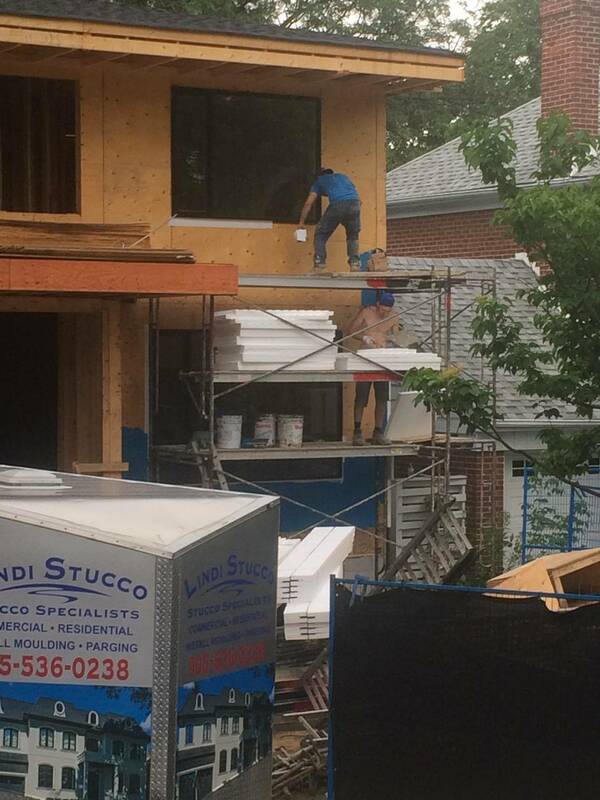 Exterior finishes being applied to the home. 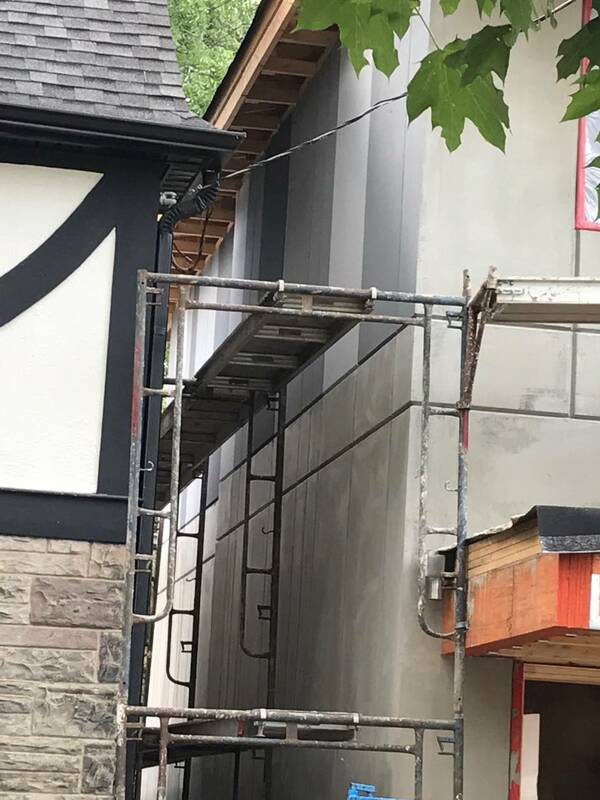 "We started the stucco two weeks ago," she noted as she watched Alban and Arian Rekaj, co-owners of Lindi Stucco, sanding the front wall. "It was raining snow and then we had a funny holdup because we had to figure out what colour we were going to do it in." The plans called for a look that resembled a polished precast limestone but lacked details. Alban Rekaj, whose father started the company in Albania before immigrating to Canada in 2000, suggested that instead of doing a single flat surface, they create a more textured finish. It is built around an irregular grid of notched lines and three different grey tones and a glaze that create the appearance of multiple panels (the stucco product they're using is Durabond). "It will create a very soft interplay of grays," said Mr. Smith. Ms. Crowder and Mr. Thomas loved the idea, and Mr. Rekaj has worked closely with Mr. Smith to execute it. But the change has meant adding several more layers of substrate, stucco and finish, as well time and money. "It takes three to four times more work," Mr. Rekaj told Ms. Crowder. Stucco was radically out of fashion for many years after this inexpensive material was found to be causing water damage in Vancouver condos. But Mr. Smith said a new generation of stucco walls are built with both insulation and internal drainage layers that make these exteriors highly energy efficient. The additional coats and sanding will make it appear smoother and more like limestone. The change added about $7,000 to the original $33,000 budgeted for the exterior, Ms. Crowder said, adding, "It's going to be worth it." With so much happening at once, those additional costs have begun to pile up. Ms. Crowder has noticed that as the various subcontractors descend on the job site, she and her husband suddenly find themselves facing numerous little decision points about extras that weren't in the original drawings – should they install an emergency generator (a $10,000 outlay; they said no) or a special outlet in the garage for an electric-vehicle plug-in (maybe). "That makes sense to me," she said. It all adds up and they've been watching their budget – which was tight from the outset – nose up steadily. "Yes, we're overbudget," she said with a sigh. "My husband is very meticulous and he's got it all in his spreadsheet." In fact, at this point, they've decided to take a zone-defence approach to what seems like an increasingly overwhelming task, with each of them bird-dogging different aspects of the project. Ms. Crowder's list includes the exterior finishes; Mr. Thomas has to get abreast of the HVAC and other internal mechanical systems. She looked up at the bulky and still exposed heating ducts that snake through the ceiling joists. "I never thought my husband would be as involved as he has been."